This is a rectangular Peninsular Furnaces, Stoves, and Ranges porcelain sign. This particular Peninsular Furnaces, Stoves, and Ranges sign is predominantly red, white, and black. 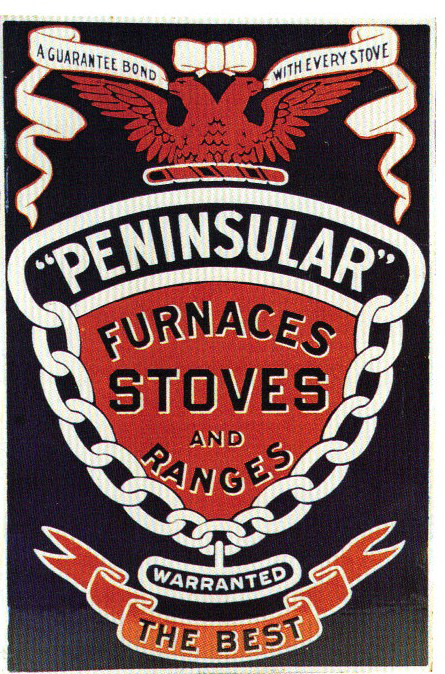 It reads, “Peninsular Furnaces, Stoves, and Ranges, Warranted The Best, A Guarantee Bond With Every Stove” and features a red two-headed eagle at the top of the sign.